The all-school assembly is open to the public; all veterans are encouraged to attend. Next week on Friday, Nov. 9, Forest Grove High School will host its 17th annual Veterans Day Assembly. From 9:20 to 10:30 a.m., students, staff and community members will come together to thank veterans for their service. "I think it's our best assembly of the year," said Forest Grove High School social studies teacher and veterans assembly coordinator Bob Wismer. "Our kids learn why they get a day off. There is a reason — and they haven't done anything, I haven't done anything, to get a day off. It's our veterans who have. We want to thank them for their service, like other schools do, and show them we appreciate what they did when their country needed them." 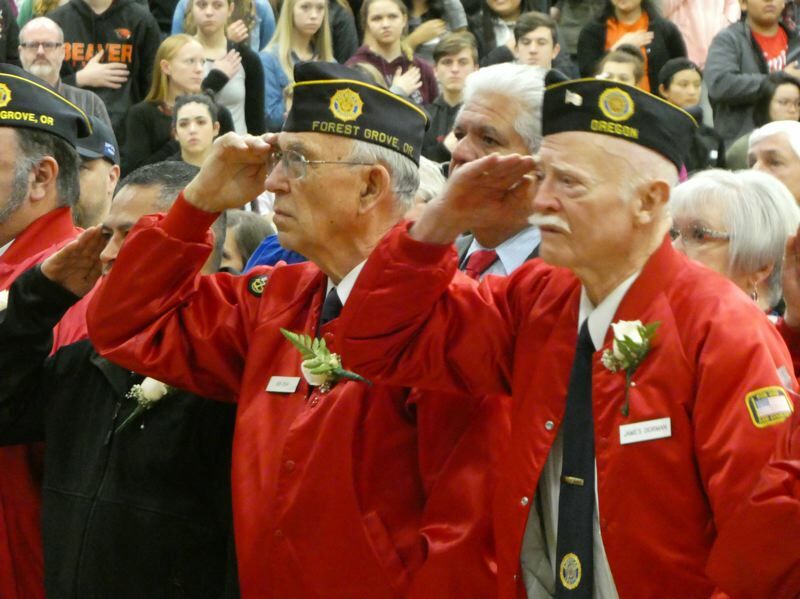 More than 100 veterans and their families are invited to attend the assembly each year, including veterans from the American Legion of Forest Grove and Banks, Wismer said. The school's choir, orchestra and band will perform and Army Capt. Kenneth Wheeler is this year's guest speaker. Organized by the social studies department, Wheeler and his colleagues try to incorporate as many district clubs and programs into the annual event, he said. "We think we have a great message of thanking our veterans," Wheeler said. "It's a big deal." The event is open to the public and all veterans and their families are encouraged to attend. Veterans should arrive between 8:45 and 9:15 a.m. A reception will follow in the school's new gymnasium.